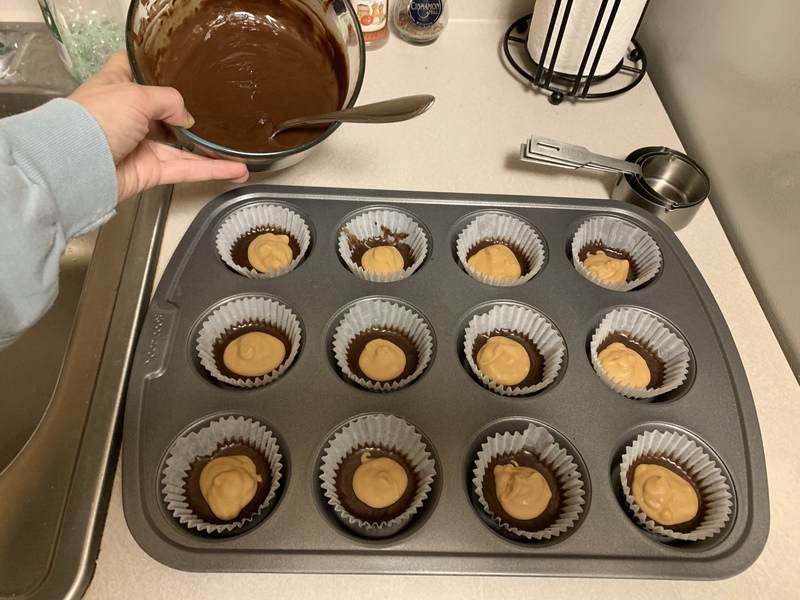 Above tonight I made the sugar free peanut butter cups! You make each layer and freeze for 10 minutes before adding the next. Then you freeze the whole thing for a half hour before putting into the fridge! Great and very tasty recipe ! It's 3 layers: chocolate, peanut butter, chocolate. everything mixed with coconut oil and a few other ingredients! very decadent. higher cal, but only sugar is what was in the peanut butter which is a low amount of course! keto style. 1900 total cals today after taste testing the recipe ! Will do around 5 minutes of stair climbing in my apt bldg stairwell (just walking from 9th floor up to the 22nd and back down in the elevator)...i want to add this weekly at least. Lately, i'm having an issue with moodiness and feeling sad. i think it's just trying to forget about this guy Jason as since the lunch dates and communication was over a slightly long period of time for me, i'm every once in awhile reminded of the situation. but it is 75% forgotten already. but as you see, i just remembered now at work and that's why i wrote about it. Dark choc coffered espresso beans lol from another coworker (this was nice!) 100, Cliff Bar 250, Coffee 50. (was in the mood, still, for sweets). Lunch: I made it! woohoo. chicken sausage 100, stir fried asian eggplant and green veggies. YUM! 200? and popcorn 100. apple 100 450-500. Stomach is still not great at all! For some reason my whole routine is off and i'm using the bathroom in the night and evening aside from in the morning. eh, it'll switch itself back. Our weather is going to be messy I believe on the commute home, so i'm going to wear my rain/snow boots and just take it easy tonight. No plans for a long walk or extra exercise. I will def enjoy a nice, earlier bedtime compared to last night! I always tend to go to bed late on my weights nights. It's a long routine, with rests, around 3 hours, but I enjoy it and do NOT want to change it. I do snack during the routine and drink lots of fluids. With taxes done, I really am eager to start delving into reading about Paris. I'll actually take a book out of the library to look at during my commute. I still have the other book, Colin Powell's autobiography, and i didn't want to stop reading it without finishing it :( I have around 200 pages left out of over 600. I'm going to try to finish it by the end of this weekend. I'd rather finish it before getting the book on Paris. I went to bed around 11pm after a good workout. A lot of the workout went very efficiently and at a good pace. I do stop to do little tasks (since i am home!) during my workout. For instance, I may clean up the kitchen or clean up papers. And last night I decided, near the end of my workout when i want little breaks anyways, to send in my taxes!!!! I had the taxes already completed and ready to send, so i just had to fill out a few quick answers to prove my identify with Turbo Tax and then around 15 min later after going thru their questions and information, off my taxes went! Woohoo. This year, i'm getting around $1k back of which will go to my savings. :) Basically, it's not extra, it's more like i'm paying back what i've borrowed from that account this year! I'm very happy to get anything back! I have been, here and there, able to forget about Jason. It's a good thing of that. I'm a single person and prob will be that way for a long time to come. I had no plans to be dating now and i'm happy i'm not. I figure maybe i'll be 40 and start dating. I'm still in the process of increasing fitness. I also realize that some of the traveling is distracting. I have to be able to improve fitness and travel, not travel and lose fitness. I will have shorter travels this / next year overall with Paris being the longest trip, probably, unless there' s a better flight deal. Believe it or not, I've started to think about other trip options for the fall: New Orleans or Nashville (both are just maybe's). And for the New Year, there's an option for Cairo, Egypt. Lastly, Peru is an option too. The latter two would be with Rosie, the one I stayed with in Florida and who i went to both Israel and Columbia with! I'm trying to travel because i feel safe enough at my job, if that makes sense. I feel security enough to enjoy life moreso than the past outside of work. Be able to travel and come back to a job and nice people. Progress as of today: 0.2 lbs lost so far, only 1.8 lbs to go! We ended up having to pay taxes this year - bigly. Not happy about that. It's hard to come up with a large, unexpected sum of money like that. I hope your stomach problems resolve themselves. Some months are different, and this may be a month where the hormones are affecting your digestive system more so than other months. I tend to agree with you that this will reconcile itself. It's just uncomfortable getting to that point, right? I see where you are coming from with this guy, now, and I completely agree. I think you have other things in life to focus on that WILL come to fruition. Don't need to waste any more time on something that ends in frustration or goes nowhere. Got it. Are you supposed to rest between sets for long periods of time? I could never figure that out. There's so much conflicting information out there. I like to switch exercises, like do a set of biceps and then a set of triceps. and i do that pattern 3 times, for 3 sets. You need less rest when you switch between muscle groups so they can rest a little as you transfer to the next exercise on the opposite / different body part. for instance, i'll do lunge type exercise for my legs, but then switch to abs. then i'll do these two exercises back to back (sometimes yes with rest - but not much) 3x for the 3 sets. by swapping between muscle groups, you can save yourself some rest. some exercises though, i do the 3 sets in a row, especially towards the end of my workout, then i rest more. for instance, i do overhead chest press with heavier weights (30lbs is my limit for many years i keep getting stronger but then i get weaker, and i'm always on the 30# weights for this) laying down on the bench, i do the 3 sets in a row, with extra rest inbetween each (sometimes more than 2min for sure inbetween). also, doing bicep curls i do each arm at a time and need to rest before continuing to the other arm for a minute or so to get my oxygen fully back to do a good set of biceps on the opposite arm (the second arm lol). i rest less at the beginning of the workout. but, i do not just do my weights routine like a cardio routine without rest. however, for many months i've gotten distracted a little bit, and start to research or do little things as the workout progresses into the night. i don't recommend this, but, i'll say the exercise and more oxygen to the brain has me more alert than when i'm just relaxing home on the couch and sometimes it leads to me thinking about things in a positive way or wanting to get things done at home...like my taxes to finally get them in last night. you want to have good reps. so, if you need to rest after something for a minute or so (i'm never watching the clock for exact rest, no way! i just do what i feel...), do it. you want a good set each time you are lifting. strong reps to start. PS - sorry you owed taxes, that's quite a frustrating thing when you least expect it! Sorry to hear about your tummy troubles! Hopefully they pass soon. Great job on the weights workout! yeah, for some reason my digestive system is opposite the way it usually is. i keep needing the bathroom after work and during work, with extra bloating, instead of more in the morning! I am almost back to regular and the weights once again are improving...i feel the strength coming back again! Again, hormones may have to do with the moodiness. I encourage you to try to ride it out at least until TOM is over, be kind to yourself, maybe pamper yourself a little. If you're still feeling out of sorts when the hormones have settled down, then maybe take a step further. Some months are really, really rough with the hormones. The good part is, though, that if it's hormones, it will pass. If it's depression, then that can be more difficult to navigate. such a good tip from you regarding hormones. i do think that's 99% of it this time around. and the winter weather / lack of sun. Snack / 2nd breakfast: wrap 80, egg 80, 1/4 avocado 80, salt and pepper. 250. In all honesty, i def woke up on the WRONG side of the bed and i'm feeling quite tired since getting out of bed. Slept poorly bc i woke up a few times with stomach troubles during the night. also, honestly, i'm just annoyed about the guy - Jason - situation. I had never wanted to date him in the first place. It's like i had a gut feeling against it many months ago. Then, i date him and it's going ok, but he then pulls back by texting less. I'm just annoyed that it couldn't work out because it's obvious right now and also the fact of how much i'd like a guy to like me, but personally it'd be better if i liked the guy also outright from the start. I'm just annoyed that something that could have been good with maybe a different man if he was a different man! ?, it could have had opportunity to grow. but it really seems this is not the man to even try with due to the fact he shows no attempt to try himself. eh, i just want to erase it from my mind. I don't need it now. I have my trips, my friends. My court officer / physical goals. I'm done with trying to have a serious relationship. I don't think having a less serious relationship with jason is good either. i just wish to forget him...which will work as long as he doesn't text me. Also, against my will, if he does text me, I will try my best to take always 24hours or more to get back to him. This needs to pass. I don't want him. I don't want a relationship especially with him. I'm sooo done! Plan is for weights tonight. It's def a tired day as my sleep last night was good when i slept, but partially interrupted with stomach issues. With TOM and all ending this week, I have a feeling stomach should be back to normal midweek. I'm glad i wasn't in much pain this TOM and also my skin was rather clear for the past 2 TOMS due to my healthier eating and better ways of dealing with stress / less stress! You should ALWAYS do what you think is best for YOU! Who knows where Jason is coming from or why he's not texting you back right away, but, really - who cares either! If he's not able to communicate with you the way you'd like him to, then I would let him know that and be on your way :) PERIOD. Then, whatever happens after that, at least you know you were completely honest and open with him, and he knew what you needed from him. I got some crappy sleep last night too, which is not a good way to start off the next couple of really busy weeks. Oi vey! yeah, i just don't have time for "games" and it's just weird to me to wait hours to reply to someone. that's a game to me because it's annoying and frustrating. i never really found him appealing, so, that's it i guess. i just liked that he liked me...lol. time for me to move forward. The way I see this is, he's a nice guy, which is great, and you've had a couple of nice lunches, which is also great, but I don't think this will develop into anything more than this. [If I'm wrong, that's completely fine by me.] Rather than texting or trying to flesh out the relationship, I say accept it for what it is - an occasional lunch buddy - or move on. And if you think it's healthier for you to just move on, then do it. Glad to read that you're still aiming for court officer. It's been a while since you've spoken about it, and I thought maybe your goals had changed. yeah, it is all frustrating. i don't want to think about him anymore if there's nothing to think about. i don't date often, so, it was my goal to "make it work." but, it doesn't seem there's really anything to "work" out. so, i'd like to forget and just go back to my usual life...rather than keep thinking he's interested or not and keep debating things. ...i'd like it to be done i guess so i am not distracted any further as it seems to be a waste. If your instincts are right, it sounds like things have cooled between both of you. If that’s right you can choose whether to continue or cut it off. Disappointing when things don’t work out as you hoped.Always keep the door open to other possible relationships. Breakfast: english muffin 150, half large avocado 150, egg 80, salt and pepper, kombucha 50, small bag of fun size m&m's 50. water. 500. small sips of coffee, included in total. bigger lunch: fried small meat cigars 300? Fries 200? Salad with light dressing 150?, bread 150.800. Off in a little bit to go to NJ for lunch. the NJ is right across the bridge so it will be very easy drive, under an hour :)Having lunch with great aunt, and 2 second cousins. Errands after include going to drug store to pick up monthly Rx and supermarket for yesterday's items as well as bread/wraps. Almond Milk, Milk, 2 Cartons Eggs, greek yogurt, Iced Coffee, Salami or Lox for some reason i cannot unstrike it when copying and pasting lol. so this new guy jason is entirely annoying and unreachable. he texts back hours later. I'm still not going to just "not text" him because i'm being me. i'm not changing myself. we'll see how it goes. ricky is coming over to help me set up my tv antenna so i can cancel my cable tv service this week, saving around $35 a month. every bit helps! and i hardly watch TV,so this is a no-brainer. it helps offset the costs of my high phone bill (new phone, and higher service fee since i'm not part of family plan anymore). Progress as of today: 1 lbs lost so far, only 1 lbs to go! You make a good point about this guy not being the right guy for you because he doesn't communicate the way you need him to. So... good guy friend for lunch buddy but I see now that this probably won't evolve beyond that. Lunch with the extended family sounds like it went well! I hope you enjoyed your visit. it's all good, at least i got the experience of 3 lunch dates. also, while he's fun and easy going, he hasn't really "taught" me much...i'd rather critique it now. he'd have to try much harder if he'd be interested in another date. I will TURN DOWN any next offer he makes. I don't have time for this kinda thing of unknowing. all weekend, i'm texting everyone else, no issue except for him. I'm not taking that :) Nobody else takes hours to reply. That's his life, but i'm not open to it at all and that's ok! i've been single a long time and this is not the right guy. Edit: so the guy, he's not really trying at all. For all good intentions, he may just be deciding to pull back and not pursue anything with me right now. i'll have to see him at a union meeting in a couple weeks....not happy about that....because i'd rather it be really separate i guess from union / work / business. actually, i don't even care anymore! i'm just glad that my life is at a generally slow pace right now, i can exercise, workout, and things are slow...it's a blessing in disguise and i might just need to nudge myself that things are so good. Good Morning. Naturally up early. Good sleeping. Woke up with a huge appetite. luckily, i had some things laying around in my fridge to satisfy completely! 8:30am Breakfast: half large wheat bagel still very tasty 200, 1/4 avocado 80, leftover corned beef! 200 so good!, smoked salt and some pepper, drink. 500. iced coffee soon too. 550. 1pm-2pm lunch: leftover bacon Brussels sprouts and chicken 300, chips and crackers 300. 600., dessert of keto choc chips by Lily's 50. Looking forward to tomorrow and a change of pace that it'll be. Maybe a little more reading tonight of My American Journey (autobiography of Colin Powell). Def feeling low energy with some minor thigh pain. Feeling notaglic to the days i used to binge and eat all day. Almost feel that desire, but i know better. so, drinking my seltzer and stevia and trying to read. Later, i'll go out to do errands (drug store and quick supermarket trip for Almond Milk, Milk, 2 Cartons Eggs, greek yogurt, Iced Coffee, Salami or Lox or another meat!, maybe another pepper or two), before going to gym prob around 4:30pm-5pm starting the gym. Right now it's 2pm, at least i already showered earlier, so really whenever i want to get up and go, i can. and honestly, i'll settle into a home workout tonight instead, we'll see how i feel. TOM is here, thankfully but annoyingly. but mostly thankfully bc it seems that when i'm traveling at the end of April, i will not have this TOM which is a great thing!....! I'm a little lower energy today, just wanna relax and read my book and maybe make a bigger dent in it. When i'm done with this book (still only about halfway thru and it's long), i'm switching gears. I will be reading and reading on Paris so i can have it all planned a month before the trip which is set for the last few days of April into May. I want most of the plans (each day planned in advance! ), a month before or so that i actually go on the trip. I don't want it planned last minute and my host will appreciate having the plans, too. In fact, i'm emailing her of my goal - that by end of March, the trip is planned each day. I’m really not in the mood to do anything today - and not feeling too bad about that ! Except TOM - just finished up, don't need to go there again any time soon. I won't pry to ask if anything specific happened with the guy. However, I want to encourage you to hold your head up high when you go to that union meeting. You're a fantastic person, fun to be with and good-hearted. So you just let that shine through so that he (and the world) know it. And life is wonderful for you - you have Paris coming up! And for now, things might seem slow but that doesn't mean that nothing's happening: planning, thinking, dreaming, working out. It's a bit too uncommunicative and i like texting. I PREFER it to a phone call as a way to keep up with someone during the week. And being that my DAD is by far the busiest man i know, i don't really feel this guy Jason is trying anymore and that's fine. i was very honest with him the whole time on the "lunch dates." Nothing specific at all, just, he is busy and it's quite annoying on the weekend with the lack of returning texts on weekend in a timely manner as i do not trust that he doesn't see the text right way on his phone and is ignoring which isn't cool, that's all. dating him was a nice distraction and challenge since i don't date often that why i say it like that...a challenge to spend time with a new man. but, i'm going to have to PULL BACK COMPLETELY. i have chased men (Paul and one other) in the past. I have provided (paid) for Ricky in the past. I'd treat Ricky with little things (nothing expensive). But lessons learned: every time i gave too much of myself to a man, it was NOT helpful at ALL! I have to "give him a taste of his medicine" and actually wait hours or a day to reply. because it's annoying for someone to do that to someone, so i'll have to do it - if he even texts me back! I woke up before my alarm but got a really great amount of sleep from prob 9pm until 7:30am today :) Needed that!..Hoping this will be how the weekend is for me! The LONG weekend, as I'm off for President's Day on Monday woohoo! Breakfast: english muffin whole wheat 150, 1/4 avocado 70, egg 80, smoked sea salt and pepper, iced coffee 50. 350 and VERY tasty. 1pm Boston market bowl: bacon Brussels & chicken so tasty chicken 150? and lots of tasty brussel sprouts with bacon 250? 400. 1250 wish I took a nap but no time for it, had some coffee instead, soon leaving to go to friends house for party...would rather sleep now lol. I got good exercise in morning and had a successful Saturday!! Overall a good eating day, not more than 2200, great choices at the party and some dessert. glad i brought my veggies! otherwise, it wouldn't have been good. eats at the party: half a large pita 200, meat 50 (not much), fried falafels 200?, veggies galore 100, pretzels 50, fruit 50, half brownie 100, shortbread cookie 150, alcohol 100. total approx: 900 or so. Today I am going to the bank, leaving here around 9:20am to get there by 10am to get a better deal on my matured CD. I really wanted to transfer the CD from Sterling to Citibank with my other accounts, but, the percentage is actually higher at Sterling. Plus, I made an appointment so if i do not have to wait long, I'll just simply renew the account at the higher percentage there and not move the CD from one bank to another yet :). Sterling bank is official awful though! Besides a good rate, they have closed the branch right within my neighborhood. And the next closest branch is CLOSED on BOTH Saturday and Sunday! So, instead of driving, I will take public transporation today to the NEXT closest bank after the one that is closed Saturdays. It's located close to the subway and i'd rather not deal with parking :) Then, i have an appointment for dr at 11:30am that will be fast at the location where i also wanted to go to the Sterling bank today which is closed today...so i will take the train heading right back to my appt which is also right by the subway! then, i'll head back home. After the dr at around 12pm, I'll take the check i get from Sterling to Citibank which is located a couple blocks from the Dr, at put the money in a new CD at Citibank. YES. Really, i had wanted to take the money from Sterling to Citibank, which is located right by the doctor. ....I may just do this, as Sterling is a pain in the neck and the Citibank rate is slightly lower, but similar. I think Sterling is a pain, so i will try to still pull my money out. citibank is convenient and located everywhere, so, might as well move my money today while time is on my side (while i have time to run these types of errands). who knows when all of Sterling will be defunct! The reason i decided on public trans today for the bank and errand is because everything is located straight up from the subway, so it's rather simple and i get some walking in between these activities. I wasn't in mood to sit around the entire long weekend, as you can see! So i was proactive in making plans. Tomorrow's a gym day / laundry day / clean hamster cage type of day. I was possibly going to train my coworker at the gym, but she didn't contact me about it. with my weekend booked up, i can wait to train her another time ! Monday I have really great lunch plans, located a bit farther away in Englewood, NJ, with somewhat distant but loving family of 1 or 2 older women and my older male cousin. We see each other only relatively small amount of time each year, so i'm glad i made the plans as a welcome change for the long weekend with these very pleasant folks!!!!! <3 and family they are! (they are cousins and Aunt but not first cousins or direct aunt, it's down the line if that makes sense). I have to thank you for the comment you made on my entry the other night - how we would BOTH be working out that night. Wow, that REALLY helped me SO much - to know that someone else was working out too. It helped me get started and see the workout through, because I knew you were doing it too. i'm glad my comment helped you...it's def helpful when we realize that there's a lot of people in our boat, doing things to better ourselves! and that we choose to spend some time on it so we can feel better about ourselves emotionally, physically, mentally! it's worth it!!!! Breakfast: wrap 120, egg 80, half avocado 150, 2 chocolates 100 at most, starbucks nitro brew for my expensive taste (wow the caffeine is sky-high in it! as i am drinking it!) 50; 6 fruit mentos aroud 10am. 60. 12:30 Lunch: from home: microvable frozen 3 Italian cheese cauliflower cooked the cauliflower and it didn't go with the chinese, additionally i forgot my tubberware, just threw the cheesy cauliflower out unfortunately... frozen tasty Chinese fish 200 and veggie leftovers (tasty) 150. i also brought some of a bagel 200 for carbs...will walk after lunch to buy powdered peanut flour / butter for a keto pb cup recipe i'm making this weekend! 550. 3:00-3:30pm apple 50 followed later by real white chocolate coated reese's i found on sale at rite aid during lunch. 200.
thinking for it to be a veggie type of meal, not sure...this week i didn't eat as healthy as i usually do, skipping almonds and eating the atkins pb cups instead which really weren't as good as i remembered them being the last time i bought them! After work plan: walk to nearby New York City (Manhattan) Library to read there until library closes, then take subway home & also do the 3mi walk....then early to bed. Tomorrow i have good errands to take money from one CD account in one bank (Sterling which i haven't enjoyed banking with due to few locations and long wait times to get anything done) and transfer the money to my regular bank for everything (citibank) which i LOVE. Banks are open tomorrow and I have to get this done tomorrow. I have only a window of one week to get the funds outta one bank and into the other before the CD renews, so, tomorrow will be the DAY! Then tomorrow, I'm driving to a friend's place in the afternoon to see his new Co-op. just a friend, for sure on this one. then me and him are going to a bday party that is around 45 minutes away. I'm glad to drive with him, than do the 45 minute drive there and back alone! Sunday plans are TBD. I plan on a big workout and possibly making Keto Resse's cups. I won't lie, it's a little of a mood downer that J isn't able to do the lunch date today (but he's really not to blame as the plans were made quite quickly and spontaneously yesterday on my end, and only after knowing he'd wished me a Happy V-day lol...). so, he's busy. He (Jason) is one of those "actually busy," busy guys. I'm not sure it could work at all. We are DEF at diff points in our lives. Supriringly, although he's only 46, he actually (in his face only) looks OLDER. he's been working a LOT, had a "heartbreak" it seems from his first marriage. Jason is a good dad to his kids and works a full time job as an electrical company project manger and also does work part time as a lawyer (that's his degree) on the side. It should be good for me to find a man busier than me (opposite of Ricky who needed me to "be complete"), but, because i can still do all my goals and more. So, although it's a downer, it really is a blessing in disguise. Patience will be a virtue in dealing with this new guy Jason. this is a good thing, i just need to remain patient. Tonight i'll make up some sleep, i can tell my negative mood is mostly due to being tired. Any advice on the site, i'd appreciate. It's a bit different to date when you are older, later in life. People have their own routines, their own independence. Having to learn to live on your own, it can change people - in the best ways! Jason is likely still feeling his way through this new relationship with you, as you are with him, and it will take some compromise and patience to get through this first part while you are still getting to know each other. He had a life that you weren't part of, for a long time, and that part needs to be adjusted - and it will take time. In my relationship with an older guy that has four kids and has lived an entire life separate from mine, I still have to keep reminding myself that we don't know all the ins and outs of each other, like we would if we were high school sweethearts or simply had known each other a little earlier in life. My frame of mind - the place i'm at in life - is much different than his. I'm actually much more selfish and unwilling to compromise and I like to get my way - I think it's because I haven't had kids, and I haven't had to compromise with other people for a long time LOL. Navigating through a new relationship is not supposed to be easy! But, it SHOULD be fun, so make sure to enjoy being with this guy when you ARE together, and let the rest go for now. I can't wait to hear about your keto PB cups! Hope they turn out! Oh how nice it would be to go to the library on a Friday night. I remember as a kid, going to the library with my Grandpa on Friday nights and how wonderful that was. library there is open till 6pm and i get out at 5pm, with a 20 minute walk to the library, would be nice to read over there for a little bit tonight, but, will probably skip it as i'm getting tired and i can just read on the commute instead...and then do the hour walk home...that should be enough. i think the library would be good if we GOT OUT EARLY on occasion when we do. Regarding advice: stay busy, do your own thing. It's OK to be disappointed but not to the degree where "I was counting on this and now you canceled!" Keep it light and easy and happy. i completely need all the advice you can give and yes this isn't the scenario where i can go and get angry that mr. busy has WORK to do and not wanna play games all day ;) yes, agree fully there. also read my comment back to Legs, above, as it's meant for you also. Morning: part of a walnut cranberry muffin 200-250? from work in honor of Valentine's Day and coffee50: cals TBD (i had also brought an egg and avocado wrap but was tempted by this tasty muffin and it's good!) 250? snack:TBD also ..maybe that healthy wrap i was going to have for breakfast, yeah, gotta get some nutrition in after both dinner and this morning were empty cals.wrap 120, egg, 80, avocado 150. 350. Lunch: corned beef small amount 200 and garlic and peppers 150, half large bagel 200, atkins pb cup (shouldn't buy more, causes wayyyy too much gas...should make my own like donkey did) 100. 650. 5:30pm at home: toasted half wheat bagel (got extras from work, yum!) 200with full serving tasty cream cheese 100, 300 and an iced coffee 50. 350.
blueberries and a bar 300. And the guy i am seeing wished me a Happy Valentine's Day :) so i'm happy. guy cancelled on date for friday bc he has a conference all at 1pm...work does come first...no worries. i'LL be meeting him for lunch tomorrow since my coworkers will ALL be out except for a few and the guy cannot meet after work as he's driving to New Jersey after work to see his son's swim meet...so instead of waiting a week, i decided to ask him about lunch tomorrow, date #4. Oh how I wish I could leave early... every day. yes, it should be a shorter workday so we could exercise and get sleep and prep food, etc. and RELAX. Nice, leaving early feels awesome - enjoy your day! And your workout! i cannot wait to leave work! for some reason, i've been incredibly tired all week! The Adkins cups have malitol in them, which is why you're gettin' the gas. They are yummy but can cause digestive problems -- especially if you eat additional fiber-y food, too. Another lunch date tomorrow - fun! i don't get the problem as much with the coconut bars, never having more than one. but these pb cups, i can't handle them. I finished the small box of those cups, can't bring to work again! kombucha 50, stomach still has some issues as of late, just more gas and stuff. breakfast: banana to the rescue 120, wrap 120, egg 80, Avocado 150., milk & Matcha 50. total here: 520. 8pm dinner: cup and a half of ice cream 300 , whole fat yogurt a cup with cooked cranberries 250. 550. 5day: 2180 per day. good. Because i am still low energy and can tell my cold may come back, tonight i'll be going to bed early again. Workout will resume for Thursday. My workouts are almost 3hours long (with breaks here and there and home distractions), but it's not something i want to do tonight. Just resting tonight! AND even cooler, i'm working an hour late which i'm happy about as i'm not tired and got a second wind in to leave at 6pm instead of 5pm... in order to leave at 4pm tomorrow to get a head start on my workout tomorrow eve!!!!!!!!!!!!!!!!!!!!!!!!! YES! Yes, rest up! I thought of you last night, as I decided to turn out the lights, rather than start another chapter in the book I'm reading. I too am sensing some "vulnerability" to germs/virus, so I'll be taking precautions today as well. We are all tired of this weather and to be sick too, is awful. luckily i'm preventing it as long as i keep resting...everyone at work is getting something this Winter. Breakfast: wrap 120, with some of my corned beef extra fatty 250? it seems i shoulda waited till it cooled to drain some fat, i'll prob use hot water to melt some off the meat. coffee 50. TASTY. satisfying. lately very hungry, must be bc leading into a week before TOM..weird month i'll tell you., and one of the Atkins Peanut Butter Cups (YUM) i brought to the office 80. Lunch: a little big, but healthy: leftover chinese fish and shrimp with a few veggies 250, seaweed salad 100, large serving of chips 250, some tasty dessert crackers 50. 650. just too much though. chocolate 100, some corned beef as i was putting it away lol into the freezer 100?, 1/2 avocado 150, wrap 120, drink 30, 2 egg whites just made so tasty 50. total here: 550, better than expected actually! Happy Tuesday, with a workout already done last night, tonight's forecast is snowy mix so i'm really happy to go home, no extra walking as i'm wearing boots for snow, and sleep EARLY. need this sleep or i'll be sick again. Corned beef is just a fatty meat. Tasty though. yeah...it's very fatty especially bc all the fat in the broth it was cooking on has solidified around and on top of it! :( it's very tasty though, even this smaller amount in a breakfast wrap! yum. If it's refrigerated you might just be able to lift the fat off. yes, some i can, the rest totally solidied everywhere between the meat, i'll use hot water i think. TOM has kicked my diet donkey this week as well. Craziness, cravings, emotions, etc. me too....i'm increasingly up and down right now with emotions! My digestion is off....and feeling dehydrated after the kombucha and morning with more traffic and congestion on both the bus and subway. I picked up a banana to smooth things. 120, also whole milk in matcha tea. 80. Lunch was cooked by coworker fish (nice and light) 200 and a few brussel sprouts 100, and squash soup 200. 500.
after exercise: TBD, really hungry tonight...just pulling thru and dealing ;) ended up with a little more corned beef 200 - hopefully not more. (extra fatty bc of how it ended up in fridge...will fix it tomorrow probably...in a wrap 150. 350. 2450, fine. - high but at least i'll not be starving tomorrow morning due to only eating carbs all night! I WILL EXERCISE TONIGHT :) and bed... yeah, about that exercise, it can wait...??? debate is up about whether i'll do it tonight. feeling rather tired today. but also the work is so tedious. would be better to get the workouts done on Mon/Wed so if i do go out with the guy friday, it's not after being up late thursday night exercising..we'll see. I was going to do a home exercise tonight, but, we'll see how i feel later. It would be kinda good to do it tonight for many reasons, but we'll see. Hungry day. cravings. feeling dehydrated. that's another reason for the banana. i'd like to work out tonight, if i feel up to it later. tired day at work as i was up multiple times last night. bananas seem to regulate things for me too. Sounds like you are still not feeling 100%. Hope you felel better soon. have a good day, think!